I received my new walking stick this morning. 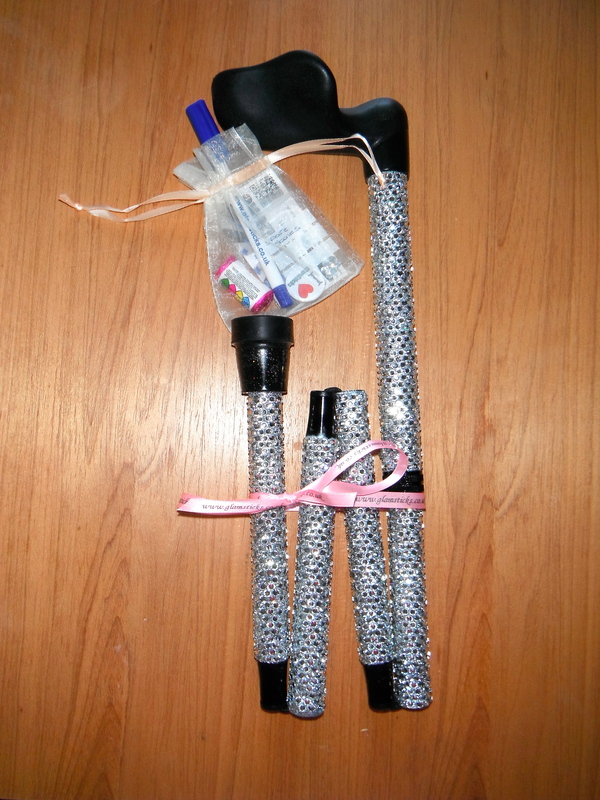 It is a sparkly spangly stick covered in over 2500 gorgeous bling rhinestones. I went for a fold away stick as I don’t need it 100% of the time, but I find myself unnecessarily using it as I have nowhere to put it. I want to reduce my dependancy on the stick, but I know that I will need it on holidays wether its down to lots of walking on city breaks, or safely getting to the pool (I’m not very good walking on wet surfaces!!). At least I can return my temporary stick to Clatterbridge in the morning, honestly the orange sticker shouting ‘Clatterbridge Oncology Dept’ was enough to force me to try walking without one…! A huge thanks to Glamsticks.co.uk for my beautiful custom made stick.